The next time you are wanting to play a card game with your friends, break out this amazing and colorful pack of playing cards displaying one of the most beautiful woman of all time, Marilyn Monroe. This deck of playing cards features 52 different graphics of Norma Jeane, better known as Marilyn Monroe. There are black and white pictures and there are colorful pictures too. 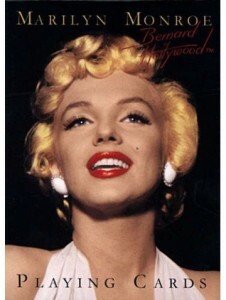 The Marilyn Monroe playing cards measures 2.5 inches by 3.5 inches by .75 inches. Just the right size to hold in your hand and take down your opponent in hearts, crazy eight’s and even poker. You choose the game, but make sure you choose this deck of playing cards.